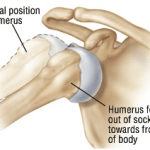 Dislocations in the shoulder joint involve the ball, or humeral head, coming out of the socket, the glenoid. 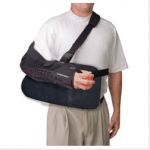 Dislocations typically take place following severe trauma, collision, or fall where the arm is placed in extreme positions. Individuals who are predisposed to instability may experience subtle dislocations during everyday activities. If the humeral head immediately slides back into place without manipulation, the event is termed a subluxation. Symptoms of a shoulder dislocation include extreme pain in the shoulder region, restricted motion, a popping or gliding sensation, and apprehension or guarding in certain positions. The patient or others may notice an altered visual appearance of the shoulder. Most people with instability are aware of what positions cause the instability or dislocations, and are fearful of those positions. The shoulder joint relies heavily on its surrounding muscles, tendons and ligaments for support due to the shallow nature of the glenoid. Of particular importance is the labrum, the rim around the glenoid, which is usually compromised or torn in unstable shoulders. In order for the shoulder to come out of the socket, the labrum and soft tissues are compromised. When the labrum or other soft tissues become stretched or damaged, the joint becomes more susceptible to future dislocations, subluxations and pain. The risk of recurrent dislocation increases after every dislocation event. In patients under 40 years old, dislocations often require surgery. For young, active individuals, immediate arthroscopic repair may be required to prevent further dislocations. In other circumstances, treatment for dislocations and instability of the shoulder joint generally begins with physical therapy to strengthen the muscles surrounding the joint. In these cases, surgery is reserved for those who fail to improve with therapy. When surgery is required, Dr. Domb most commonly repairs the injury arthroscopically. In cases where previous surgery has been done and instability or dislocations have recurred, other specialized surgeries may be performed by Dr. Domb, such as a Bristow, Remplissage or Latarjet procedure.